Eastbury Road 1912 - a quiet lane before development. Vantage point i suspect out of shot, this'll be as near as I can get. Railway Bridge Crossing Wiggenhall Rd, only the embankment to it survives today. Watford Silk Mill built in 1770 by Thomas Deacon. St.Matthew's Church, Oxhey, built in 1880. 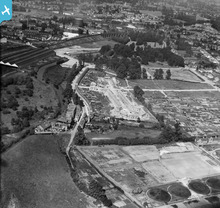 An interesting photo of the southern margins of Watford and the varied land uses in the Colne valley near Oxhey. The Rookery Silk Mill was situated on the river Colne, where a set of sluices controlled the flow of water into the works. At its peak in the late 18th century, the mill was three storeys high and employed 100 people, a major manufactory of the Watford area. In 1881, the mill closed and was replaced by the Watford Steam Laundry & Dye Works, as shown on the 1898 Ordnance Survey Map. The buildings were later converted into a factory producing pianos and eventually were reported as being workshops and offices for engineers and joiners in the early 1970s. A rare view of the southern extremity of Watford during the interwar period. 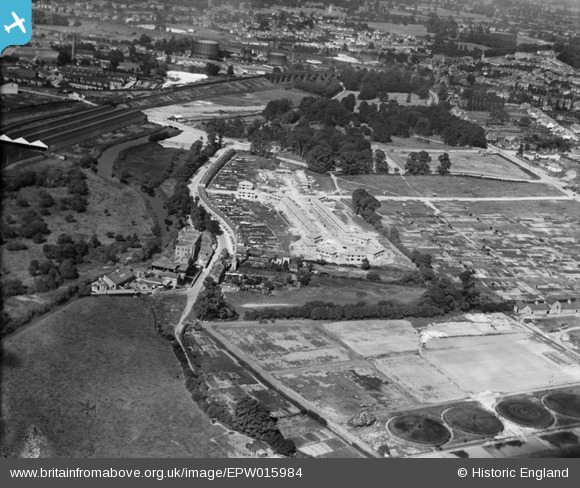 In the right foreground are the settling tanks and filter beds of the Bushey UDC Sewage Works, beyond which is Riverside Road (1920 terraces) and the former silk mill on the banks of the river Colne.In the centre of picture, the new housing and streets of Crossmead and Colne Avenue are readily apparent, whereas to the left (north) are the 1915 LNWR Carriage Sheds at Croxley Green Junction. In the distance, is the 1912 viaduct carrying the LMS Croxley Green and Bushey Curves over the river Colne. Note: after the Railway Act of 1921, the London & North-Western Railway (LNWR) became the London Midland & Scottish Railway (LMS) as part of the "Big Four" Grouping on January 1st, 1923.